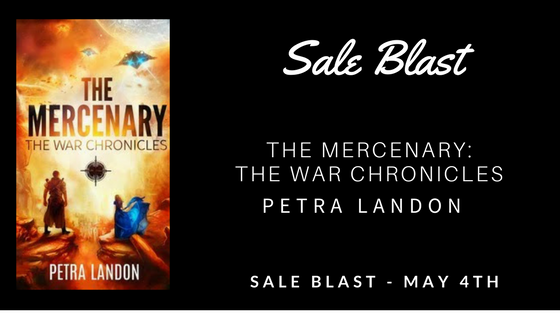 If you love scifi romances and space operas, better hurry because the sales blast for The Mercenary is ending today. On Sale for $0.99 for the Blast! She's a prisoner of the Imperial Forces. He's a nomad with a mercenary army. Can her desperate gamble and a fierce warrior's love turn the tide of war and rewrite the destiny of their corner of the galaxy? In a distant corner of the galaxy, Quadrant Five burns in the flames of a deadly war. The Budheya people are one of the worst affected. Author's Note : A spirited and resilient girl, a fierce warrior with a mighty heart, a fiery passion that flares amidst the debris of a deadly war and a love that will alter the fate of an entire quadrant. This is a standalone story that sets the scene for The War Chronicles - a collection of futuristic SciFi Romance & Space Opera tales with passionate love stories and swashbuckling adventure. The book has been nominated for Ind’Tale Magazine’s 2018 RONE Award in the Sci-Fi/Time Travel category. Reader voting is currently open! The Unta-Golar clipped away the device before sauntering over unhurriedly to stare down at Saakshi, on her knees on the station’s dirt-crusted floor. She raised pain-filled eyes to the Ketaari officer, unwilling to cower before him. He flashed her a cruel smile before swinging a meaty fist at her. Saakshi closed her eyes in defeat, her pain-wracked body unable to garner the strength to move itself clear of the inevitable blow. The blow never landed. Instead, Saakshi heard the distinct sounds of a scuffle, followed by some heavy blows. When she dared to open her eyes moments later, the Unta-Golar lay in an awkward tangle in a corner of the alley, caged in by two adjoining walls and the massive body of the Hadari’Kor Captain. The Hadari’Kor male leaned threateningly over the Ketaari Unta-Golar, whose stocky body cowered back against the wall. The Ketaari male’s legs lay sprawled out, one heel drumming uncontrollably on the floor in distress. One of his arms lay bent at an unnatural angle, and pale blue blood seeped sluggishly from cuts to his forehead ridges and the corner of his mouth. His eyes stared wildly up at the Captain, while his good arm alternated between pounding ineffectually on the Captain’s shoulder and trying to claw away the large hand that squeezed his throat inexorably. The Captain had crowded the other male into a corner to brace himself against the wall with one hand, while his other hand, wrapped around the Unta-Golar’s throat, throttled him slowly. That this entire scene was enacted in complete silence by participants and spectators alike made it seem almost surreal to the Budheya girl watching it play out dispassionately. Saakshi allowed herself to slowly slide down to rest on her bottom, splaying out her legs before her with palms braced against the floor to support her weight. She leaned back comfortably on her hands, content to watch the unfolding show. Thank the Pura, he came. Better late than never, I guess. From her position, she could clearly see every expression reflected on the Unta-Golar’s face, but not the Captain’s, whose back faced her. “This is for using the pain implant, Ketaari murtobak” the Captain bit out in sudden fury, his words breaking the silence in the narrow alley. He flicked off the fist pounding on his shoulder with a casual shrug as he stared down at the Unta-Golar. “If you ever touch her again, I will personally break every bone in your body. Are we clear?” the coldly furious voice demanded of the Ketaari. The Ketaari male stared back at him with vicious eyes, his expression uncowed. The Captain casually exerted a little more pressure around the Unta-Golar’s windpipe, and the Ketaari’s legs went limp, his face turning bloodless and pale. “Are we clear?” the Captain repeated, more softly this time. The Ketaari nodded, his pale eyes a tad unfocussed, though the expression on his face promised retribution. The Captain finally let go of his punishing hold on the other male’s throat, to leave the Ketaari limp and panting on the floor. The Hadari’Kor male sprang to his feet fluidly, turning his back on the male gasping for breath at his feet to stride over to Saakshi. For a moment, he gazed down at her in silence. An emotion she’d be hard-pressed to identify flashed though the tightly leashed fury on his face. The black eyes glittered with anger and something akin to regret. “Are you hurt?” he asked gruffly. Saakshi shook her head mutely. “The pain implant?” he inquired, the black eyes holding her captive. “The effect has worn off” she responded calmly. “Come” he commanded, holding out his hand imperiously to her. Saakshi retrieved the piece of control panel she’d used on the Ketaari to tuck it back in its usual hiding place in her boot. The black eyes watched her silently, the palm still held out to her. She allowed him to pull her up and steer her through the small crowd of spectators, a large palm at the small of her back guiding her. They walked in silence towards his ship, stopping just once to attach the suppressor device to her bracelet to enable her to bypass the station’s exit sensors. Once they were alone in the shuttle and on their way to his docked ship, he turned to face her. Her eyes snapped up to meet the regret in those dark eyes. Saakshi nodded to acknowledge his apology. “You fight pretty well for a tiny female” he remarked approvingly after a short silence. She managed a wan smile at the double-edged compliment. “How much did you see?” she asked him. “Enough” he gritted out, his teeth clenching. “Didn’t they teach you when to run?” he inquired softly after a short pause. The Captain hit the shuttle wall with his open palm, cursing fluently and with ease in a variety of different languages. “Son of a swine” she interjected, not wanting to be left out of the cursing party. After an instant of stunned astonishment, his expression lightened. “No doubt” he agreed, his dark eyes filling with soft laughter. “Ketaari murtobak” she offered next, showing off the single word in his language she knew. She’d learnt it by paying attention to his cuss words, the ones she could decipher anyway. “Absolutely” he gasped out, bursting into unfettered laughter. The effect was to make him look years younger without the serious and unapproachable mien he usually radiated. “What does it mean?” she asked him, her eyes observing the laughter on his face. “Unknown paternity” he responded, his face still lit up with amusement. An avid reader all her life, only recently has Petra allowed her own imagination to run riot. She loves to travel, loves the outdoors and reads everything she can get her hands on, time permitting. Her taste in books is very eclectic – she tends to like stories with vivid and quirky characters that have elements of fantasy, adventure, romance and mystery interspersed together. A good book for her is one that makes the reader think long after it has been finished and set aside. And one that draws the reader back to it, again and again. To share the characters and tales that have lived in her imagination for so long is a labor of love and a lifelong dream come true for her.